"The civil rights movement was a movement sustained by music," Obama said. President Obama and the first lady welcomed Smokey Robinson, Bob Dylan, Joan Baez and other music stars to the White House Tuesday for a special concert honoring the civil rights movement. Crediting protest songs from that era and their spiritual predecessors for his election, the nation's first black president, transformed the East Room’s grand ballroom into a concert hall packed with members of his Cabinet, Congress, civil rights leaders and students for a program that will air on public television later this week for Black History Month. Queen Latifah's rendition of the Marvin Gaye classic "What's Going On" and Yolanda Adams' spirited rendition of Sam Cooke's "A Change Is Gonna Come" were early highlights of a night that continued the Obamas' effort to open the White House to America's soundtrack. "The civil rights movement was a movement sustained by music," Obama said as he welcomed his audience. He said activists from coast to coast were inspired by spirituals, felt their will sharpened by protest songs and base broadened by artists of hope. He said their work paved the way toward a more just America that allowed him to make history in 2008 with his election. "Tonight, we celebrate the music of the movement," Obama said. That celebration was supposed to come on Wednesday, but faced with another major winter storm the White House decided to move the concert ahead by a day to beat what could be a second crippling snowfall in a week. As guests packed the first floor of the executive mansion, heavy snow landed on the South Lawn and blanketed the rest of Washington. Other stars scheduled to perform were Natalie Cole, Jennifer Hudson, John Legend, John Mellencamp, Seal and the Blind Boys of Alabama. The Howard University Choir and The Freedom Singers performed at a mansion that in its history was maintained by slaves. Morgan Freeman, who read excerpts from historical works throughout the night, harkened back to the song lyrics Obama invoked during his election-night victory speech in Chicago's Grant Park. "A long time coming," Freeman said. He later deadpanned: "I wish I could sing." 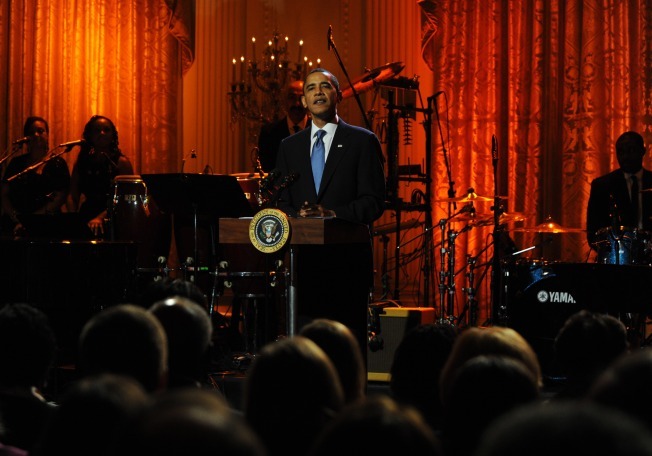 Obama said the music helped the movement's faith as their leaders were jailed and their churches bombed. "It's hard to sing when times are rough," Obama said. "The hymns helped ... advance the cause of the nation." Tuesday night's concert is just the latest imprint first lady Michelle Obama has left on Washington's social scene. There was a conga line to Earth, Wind and Fire's performance when the Obamas hosted the nation's governors a year ago. Stevie Wonder played a concert in the East Room last year. Marc Anthony took to the South Lawn for an evening of Latin music, and Foo Fighters played the Fourth of July party there. Michelle Obama also brought top classical music performers such as Joshua Bell to the White House to work with high school students. That model repeated itself in a pre-concert workshop Tuesday when they heard from Robinson and Dr. Bernice Johnson Reagon, one of the original Freedom Singers in the 1960s who traveled around the country sharing stories from the civil rights movement. Adams and Toshi Reagon also took up microphones and performed songs from that era. Obama election should be a point of pride for the students in the regal dining room, Robinson told students. "We've come a long, long way," said Robinson, who also performed. The concert was to be televised at 8 p.m. Thursday on public broadcasting stations nationwide as part of the "In Performance at the White House" series. National Public Radio also planned a one-hour concert special from the event to be broadcast nationwide on NPR stations beginning Friday. Washington has been buried in snow since winter weather began piling onto the region Friday. Some places were already under nearly 3 feet, and another round could dump as much of 20 inches in the Washington region by Wednesday night.